Using agile environments (.net, java, etc.) as input, Altimesh Hybridizer generates source code for multicore and manycore platforms. Benefit from the computing power of current and future hardware with minimal code changes. Don’t take in-house staff away from more critical projects. Obtain benchmark performance. Code generated by the Hybridizer can perform at a level similar to hand-tuned code. 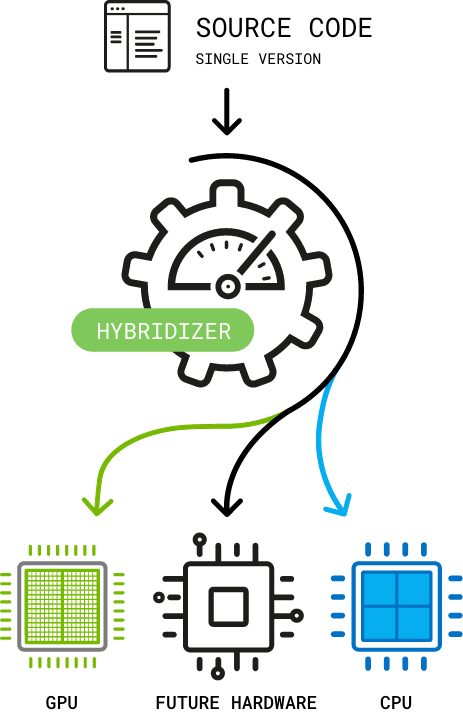 Hybridizer is a productivity tool for software developers who want to enable accelerators for their calculations. Using dot net or java binary as input, it can generate source code for multi-core and many-core platforms. Using parallelization patterns, such as Parallel.For or distributing parallel work by hand, the user can benefit from the compute power of the accelerators without entering the learning curve of the internal architecture jargon. All of this flexibility does not come at the expense of performances loss. As our benchmark illustrate, code generated by the Hybridizer can perform as well as hand-written code, achieving up to 93% of hardware peak performance.